The British Foreign and Commonwealth Office (FCO) have announced the appointment of a new British High Commissioner to Sierra Leone. The new appointee is Mr. 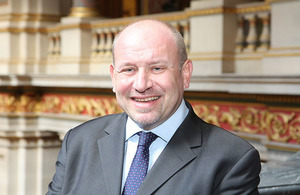 Guy Warrington (Photo), who started his career in international diplomacy in 1986 with the FCO. Since then, Guy’s career has taken him through the corridors of the UN, where in 1992 to 1993 he served as the British government’s Second Secretary at the UK Mission to the United Nations in New York. 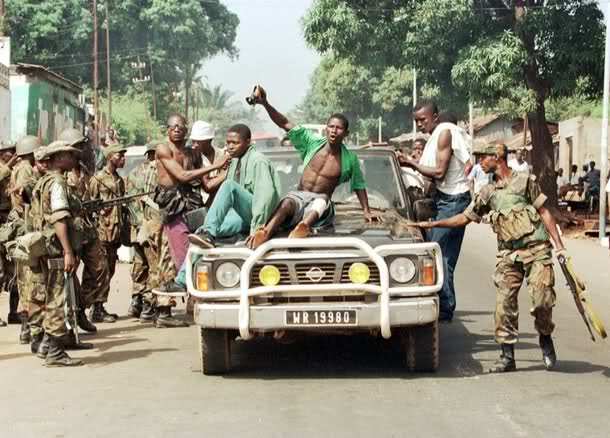 1992 to 1993 was a difficult period for Sierra Leone, as the rebel war started to unfold into one of the most brutal civil wars in history. How to stop the massacre of tens of thousands of innocent people across Sierra Leone by the RUF was a subject that preoccupied diplomats, including Guy Warrington at the UN. A battalion of young and disgruntled soldiers, led by Captain Valentine Strasser, Julius Maada Bio and others had toppled the corrupt civilian government of the APC. The RUF rebel leader – Foday Sankoh, threatened to overrun Freetown. Sierra Leone had disintegrated into a failed state. In 1993 to 1995, Guy was transferred to head the FCO’s Levant Section of the Near East & North Africa Department, but then returned to the UN, where he was placed in charge of the British government’s Humanitarian & War Crimes Section at the United Nations Department – a post he held for two years, until 1997. The war in Sierra Leone was still raging. Peace was a long way off. The British government, the international community and the UN searched for a sustainable resolution of the conflict that had taken the lives of over 100,000 people. Guy Warrington’s experience at the FCO’s Humanitarian & War Crimes Section at the United Nations Department would have brought him closer to the suffering of the people of Sierra Leone, as rebels and government soldiers went on the rampage, committing serious atrocities and war crimes. Sierra Leone has enjoyed almost fifteen years of relative peace. But it would be naïve to suggest that the peace building process is over. It would also be naïve to suggest that the multi-party democratic process, cobbled together after the war is working in perfect harmony with the country’s 1991 Constitution. Far from it. President Koroma has recently torn up a page from the Constitution, with the support of his handpicked Supreme Court Judges, after he had unconstitutionally sacked the country’s vice president (Photo: Koroma – left, and his sacked vice president Sumana). The strength and durability of the peace in Sierra Leone is often tested, especially at elections, when political violence always returns to the centre stage. And as the country struggles to defeat the Ebola virus – the new enemy in town, the struggle for political leadership has begun, well in advance of the 2018 general, presidential and local elections. The role of the international community in monitoring and overseeing the democratic process in Sierra Leone remains crucial, with 2018 on the horizon. The Chinese – the new lord of the manor, are now the largest single foreign investor in Sierra Leone, controlling over 80% of the country’s natural resources. But given their disregard for human rights, civil liberty and democracy, they cannot be relied upon to ensure that president Koroma plays by the rules and abides by the country’s constitution. But on almost all of those human development indices, the government of president Koroma has failed the people of Sierra Leone. According to the latest Mo Ibrahim Africa Governance Report, Sierra Leone has one of the worst healthcare in Africa, with only Chad and Somalia fairing worse. This was even before Ebola came to Sierra Leone last year. In March 2016, Guy Warrington will become the new man at the head of the British High Commission in Serra Leone. He will replace Peter West who has been in post since the 28th of February, 2013. 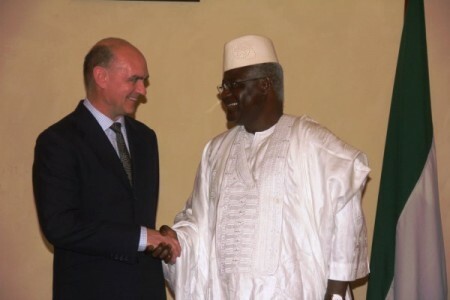 (Photo: Outgoing High Commissioner Peter West and President Koroma). Guy Warrington is the man at the British High Commission in Freetown who will drive forward the British government’s mission in the country, bringing his unique blend of expertise and experience gained at the United Nations, to help consolidate Sierra Leone’s democratic gains and peacebuilding process. Many Sierra Leoneans are apprehensive that perhaps the 2018 elections may well go down in history as the most challenging for the country’s peace building process, since the end of the war in 2001. 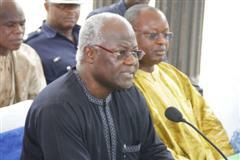 But much depends on what president Koroma does with the country’s Constitution, to further his third term in office ambition. There are concerns that large stocks of arms and ammunition have been stockpiled in Sierra Leone by rogue politicians, which could potentially be used to perpetrate political violence. Much also depends on the manner with which the 2018 presidential candidacy election within the country’s main opposition SLPP party is conducted; and the modus operandi of the former NPRC military leader – Julius Maada Bio, who will also be contesting that election. The former Brigadier is being accused of using violence and intimidation to prevent a free, fair and inclusive SLPP leadership election, which is expected to take place by the end of this year. Guy Warrington’s experience at the UN will be invaluable in helping politicians in Sierra Leone, walk the straight and narrow. Following his two years sojourning as the head of the Humanitarian & War Crimes Section – United Nations Department of the FCO in 1997, he was sent to Geneva, where he headed the Specialised Agencies Section at the UK Missions to the United Nations. And in 2001, he became the FCO’s Deputy Head of the Drugs & International Crime Department. Guy is currently the Director of the UK Trade and Investment responsible for the English Regions, a post he has held since 2013. I wish to welcome Guy to Sierra Leone as the New British High Commission to Sierra Leone. Surely his experience in diplomatic Missions around the UN will make a big difference in the relationship between UK and my beloved country. I want to use this opportunity to invite Guy to Blama in the Kenema district on the 2nd of Nov. 2016, for the celebration of the ‘All Souls’ Day’. The parish community is presently rehabilitating the grave of one British soldier who died in a plane crash during the second war world. He surely has a good CV and he will one day go for the Prime Ministerial position.